If you read this blog a lot you’ll probably notice that I talk about solid copper center conductor RG6 cable a lot. I even link to it at SolidSignal.com, a great place to get custom lengths of cable that work well in a variety of professional situations. Have you ever wondered why? Copper is a great conductor of electricity. It’s almost as good as gold, and even though it’s expensive, it’s not as expensive as gold. It’s very flexible, easy to form, and it’s readily available. Copper is, in many ways the perfect choice for sending signal from one place to another. However, copper is generally a lot more expensive than steel or aluminum. While steel and aluminum are more durable and stronger than copper, this is usually not important in cables. What is important is how much signal is lost from one end to another. The skin effect is what makes copper-clad steel cables possible. Steel is a fairly poor conductor of electricity and so it has roughly twice the signal loss per foot of copper. However, you don’t actually have that level of signal loss if the cable is steel in the center with just a thin plating of copper. As long as the copper on the outside is in good shape, you’re fine. You tend to end up with problems with steel cable when it comes to voltage. If there’s something on the other end of the cable that needs power, steel cables are a poor choice because that voltage won’t get where it needs to go. This is true of antenna rotators, amplifiers, and satellite equipment. All of those devices need power to be supplied over the cable and if it’s not being supplied by copper cables, it might not be enough voltage. I tested Solid Signal cable against home-store RG6 cable. I went for a reasonable quality cable and to keep apples-to-apples, I cut the molded ends off the cable and added brand new top quality connectors from Solid Signal. 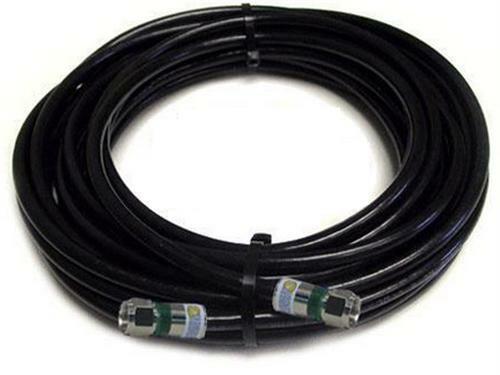 These are the same connectors used in commercial satellite installations. I used two lengths of cable that were both listed as 50 feet. I even strung them both out to make sure they were measured properly. To get power readings, I used a PI-29Z power inserter to supply the voltage on one end, and measured it with a multimeter at the beginning and at the end of the cable run. Here are the results. The loss on the copper-clad steel cable was more than twice what I saw from the solid copper cable. This is important! A satellite dish, for example, needs about 19 volts at the dish to function properly. After only 50 feet of cable I don’t have a lot to spare if I’m using copper-clad steel. On the other hand, I used a Televes DigiNova to supply signal to the cable. I measured the signal coming from the antenna using a 6″ length of cable and then measured it again at the end of two 50-foot cables. To make sure I had good results, I did not use the amplifier because I knew that the steel cable might not carry enough voltage to power the on-board amp and I didn’t want to skew the test. I used a signal meter to tune to a station about 60 miles away and recorded the results. The two measurements for the beginning of the run were just slightly different and I would attribute that to random factors. What you see is evidence that the skin effect works: the two cables perform almost identically when it comes to carrying signal. Personally I tell people that they should always use solid copper core cable everywhere. You never know where you’ll end up putting a power injector and the hope is that you’ll have this cable in place for a long time to come. However, if you’re keen to save a little money, you can use copper-clad steel cable throughout the inside of your house as long as you label one run of solid copper so you’ll know where it is. You should use solid copper for the run from the antenna or dish into the house, all the time. After a multiswitch or splitter it’s generally ok to use copper-clad steel. Isn’t it time to retire that old DIRECTV receiver? How can you change the bar color on your DIRECTV SD programs? What’s the best preamp for an FM antenna? DIRECTV in apartments — is it true that you have to call someone special?